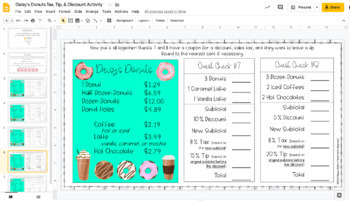 Students will practice calculating the total cost of meals at Daisy's Donuts with this fun donut-themed digital activity! Students will find the total cost for 8 different guest orders. Each order includes a combination of sales tax, tip, and/or discount. 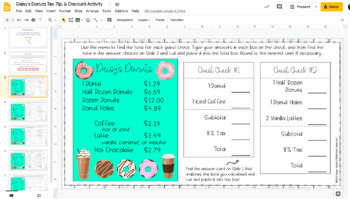 The last two checks are open-ended and allow the students to create their own orders. Please view the preview file to make sure that this activity is appropriate for your students. 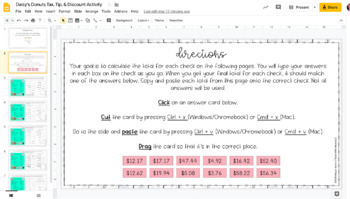 You and your students must have Google accounts and an Internet connection in order to use this activity. This activity is aligned to CCSS 7.RP.A.3. 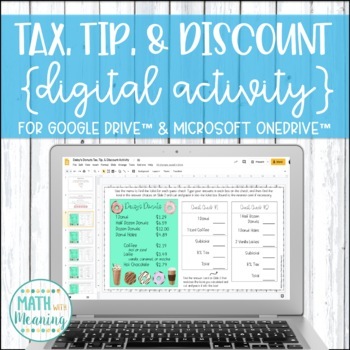 Save money by buying this resource as part of my Digital Activity Bundle Volume 2!